We’d love your help. Let us know what’s wrong with this preview of Slow News by Peter Laufer. 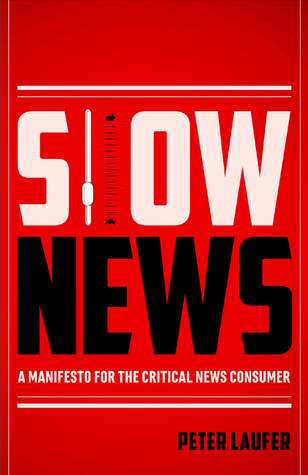 Slow News: A Manifesto for the Critical News Consumer examines the nature of news in the context of the increasingly frenetic pace of modern life in the twenty-first century. Ta With this provocative and concise book, journalist Peter Laufer launches a Slow News movement, inviting us to question the value of the perpetual empty-calorie news that accompanies our daily lives. To ask other readers questions about Slow News, please sign up. Slow News was a very frustrating read for me. Some of Laufer's points are spot on, and I like that he's encouraging people to break (or at least reconsider) their emotional investment in constant news alerts and updates. Making thoughtful decisions about what news to read or watch or listen to is a far cry from the helpless, reactive consumption patterns one can easily slip into. Cultivating a more strategic approach to media is a timely and worthwhile initiative. However, despite the volume's sl Slow News was a very frustrating read for me. Some of Laufer's points are spot on, and I like that he's encouraging people to break (or at least reconsider) their emotional investment in constant news alerts and updates. Making thoughtful decisions about what news to read or watch or listen to is a far cry from the helpless, reactive consumption patterns one can easily slip into. Cultivating a more strategic approach to media is a timely and worthwhile initiative. However, despite the volume's slim size, Slow News is quite repetitive. I think probably 20 pages could be cut without undermining the actual content of the book. Laufer's tone is also uncomfortably condescending at times. His segment entitled "Don't allow inelegant journalese to infect your personal lexicon" is one of the most infuriatingly sexist, obtuse, and patronizing pieces of prose I've encountered in a very long time. The point he's trying to make is a good one, which makes it even worse when his substantiating case study is tone deaf and irrelevant. Short, concise, common sense approach to limiting the barrage of news-- telling real news from "fake" news. In this insane 4 months of Twitter leading the news around by the nose and never being able to get REAL from the major tweeter - I would highly recommend it. I think my training as a librarian covered most of it but the description of a CNN news cycle how much time devoted to ads, teasers for upcoming segments and how much time is actually committed to transferring information may be a real Short, concise, common sense approach to limiting the barrage of news-- telling real news from "fake" news. In this insane 4 months of Twitter leading the news around by the nose and never being able to get REAL from the major tweeter - I would highly recommend it. I think my training as a librarian covered most of it but the description of a CNN news cycle how much time devoted to ads, teasers for upcoming segments and how much time is actually committed to transferring information may be a real eye opener go many people. That was awesome. I like it. Insightful, amusing, odd, thought provoking.